This is the toy my daughter plays having fun and learning in the process. When we went to walmart one day, i was just searching for some new toys. While i was searching and showing my little one few of them, she immediately got excited seeing this particular toy. Dint give a second thought before buying this toy. If we press the top button down, it spins making some funny noises . there are 2 more animals Elephant and the Bear. and they makes different animal sounds and asks to find out which animal makes such sound. So kids can learn in the process.. I try to teach my daughter showing ,this is the monkey or this is the elephant.I will spin th toy and ask her show me the monkey..where is the bear or the lion or the elephant. Its fun to play. We can give this toy when they learn how to sit and play by them selves. the only con for this toy is the music is not loud enough..well this is my personal opinion. This is a Fun Toy, I bought this toy for my little one when she was 5 months old and was crawling on her tummy..Usually Babies will have lots of fun watching this monkey making all the funny sounds .My daughter too loved this toy and was always paying attention when we switch on this toy. 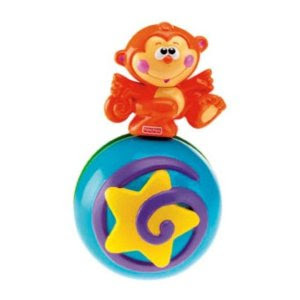 The money makes all sorts of funny noises and grabs all the attention of the babies and in the learning process,gives them a reason to learn crawling across the floor chasing this monkey on the ball..Over all its a mere fun toy and the sounds are great and funnily effective. My Daughter loved the Rhymes and all the Songs since she was days old. I use to sing her all the rhymes and she used to stop crying and all she did at that times was giving mommy all the cuty smiles listening to the songs. So thats the reason i bought this Toy for her and she instantly loved it. 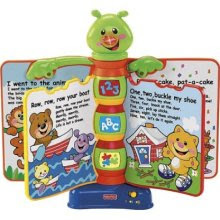 This toy looks like a Caterpillar holding the book.There are four pages in this book ,quite colorful and and she can turn the pages easily by her self and every time you turn the page , there comes 2 Rhyme songs with the lights and pictures in every page. The sound effects are great. OMG, what to write about this cute little thing.This is my daughter's favourite toy of all .Her face just lits up when ever she sees this duck. She especially likes the way it Quacks and sings the songs . 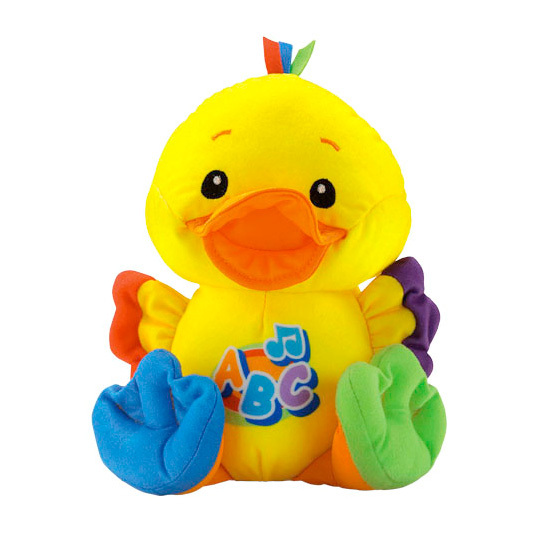 and I usually move the duck as if it is dancing while singing the song and my daughter laughs and screams will all the excitement and i my face also lits up seeing her happy and all excited. There were quite a few days when my little one hugged this ducky to bed and slept the whole afternoon.She Just loves and loves and loves this toy. 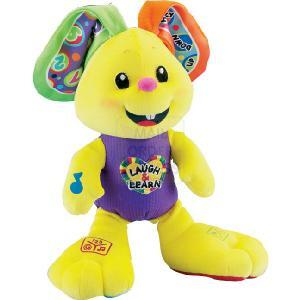 Well this bunny looks funny.It has 2 bumby feet where we can change the mode of the songs to just music or numbers or fun songs . When we switch on this toy it laughs and says''heheh..iam up and ready to play'' when ever my daughter hears to this bunny..she even wakes up from her sleep to play with this toy :) and this toy gives the description of it self with saying..I have bumby feet and two long ears and a fuzzy tail and a short nose and makes funny sounds along the way. CAUTION : WHILE BUYING THIS TOY GO FOR THE SECOND EDITION. THE FIRST EDITION HAS BEEN RECALLED. 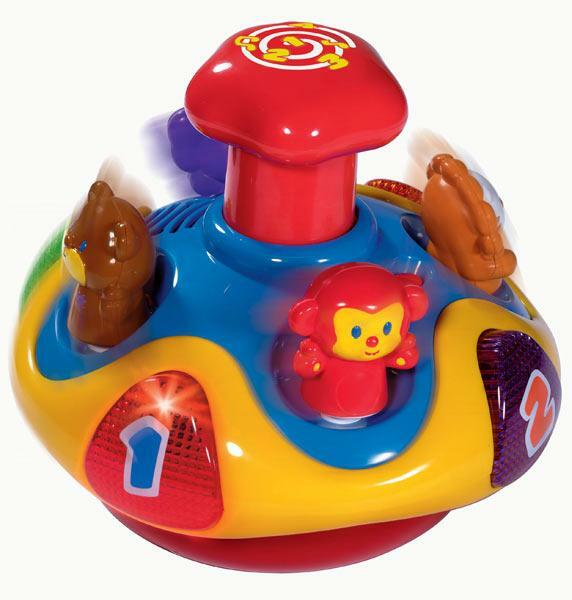 This is a very nice nice activity ball to play with.Babies usually love this so much but unfortunately my daughter does'nt show much interest on this toy to play with. Its spins by it self singing the songs and there are 3 animal buttons, Monkey,cat and the puppy and number 1,2,3 buttons on this toy .If we press the buttons the animals makes thier noises , like the cat makes meow meow and the number says 1 ,2, 3. there is a little lady bug on the top of this ball to spin around. 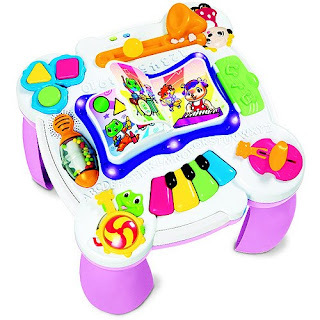 My daughter loves this toy.This is like her first Musical table . She gets excited and engaged with this toy . What can i say, this toy is full of entertainment for her with music ,songs and colorful sparkling lights . There are two modes of languages, English and Spanish . There is a piano on one side with 4 different color keys and it sings colors while playing with the piano. 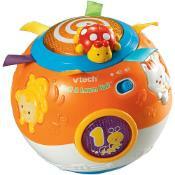 One the 2nd side, there is a spin rattel with colorfull tiny balls inside and it sings ABCD song. On the 3rd side there is this musical instrument which looks like a trumphet , and there is a key where the baby can slide from both sides and it sings the Numbers 1 to 10. On the 4th side there is a Case where the baby can learn to open and close it and says the same, when the baby opens the case it says "open'' and when closing it says ''close''. Usualy i ask my little one to open and she does . and in one corner beside the Trumpet, there are 3 key buttons in the different shapes, Square, Circle and Triangle in 3 different colors Red,Yellow and Green . So when the baby is playing with those buttons, it says its shape and color and in this process the babies can learn different shapes and colors too. Daily i sit and teach my daughter those shapes and some times if i ask her to show me the Circle, she does . There is a Violin in the another corner where she can slide the button on it. and it sings Up .High..Low..Down . In the final corner in between the piano and spin rattle , there is a tortoise with a guitar where the baby can spin it and the colorful lights sparkle around the music table saying, lights on...lights off . last but not least and most importantly there is a book in the middle of the table where the babies can change the page mode to just music or songs. The babies can either play with toy standing having fun or sit and play removing all the 4 legs of the toy . Sree, if you could, pls post a review of toys for age 2-3 yrs. I am having a tough time finding the right toys for my son. Where can I find duplo /mega locks in india? Since your daughter is almost the same age as my son, would love to know what sreya enjoys playing with..any website recommendations would be helpful.